Hateful! 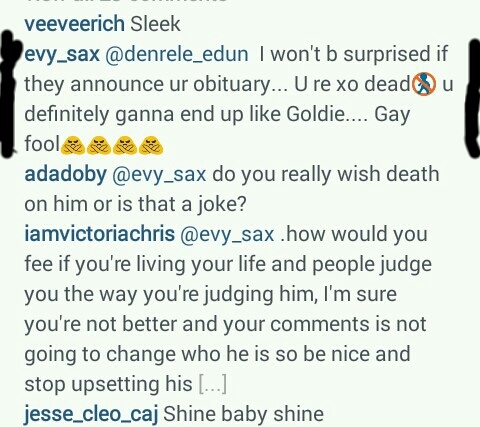 An Instagram user wishes Derenle death ~ CK Jacob: Nigerian Fiction And Lifestyle Blog. Some people are mean! How can you wish your fellow human being death? Derenle posted the above picture on Instagram and he got a hateful message. It's a free world. We can dress and behave the way we like, no one has the right to judge. Abegi, d person is just a frustrated being cos its obvious denrele didn't even offend him/her, I'm not a fan too and whatever he does remains HIS biz! Rubbish!